The 15th century Portalet Tower or Tour de Portalet in St Tropez in Provence, France was an integral part of the original defense system for St Tropez. Originally St Tropez was a little fishing village, then the Greeks from Marseille developed it into a port, only to have the Saracens destroy St Tropez in 739.Because St Tropez in Provence, is situated on a rugged peninsula the only way to reach the port was by sea, so it was obvious that the fortifications, including the Portalet Tower, which were completed in the late 15th century, would be facing the Mediterreanean Sea.Today, there is road access to St Tropez, but even as late as 1880 the 'famous' people such as the novelist Maupassant and painter Paul Signac arrived by yacht. The Portalet Tower is the starting point of the Coastal Pathway which is a scenic walk around the peninsula.Tour du Portalet in St Tropez, The Var, Provence, France, Europe. 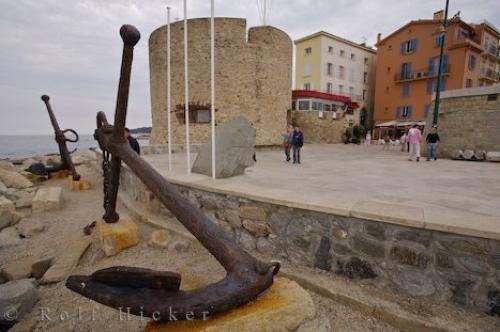 Photo of the Portalet Tower in St Tropez, in Provence, France in Europe.